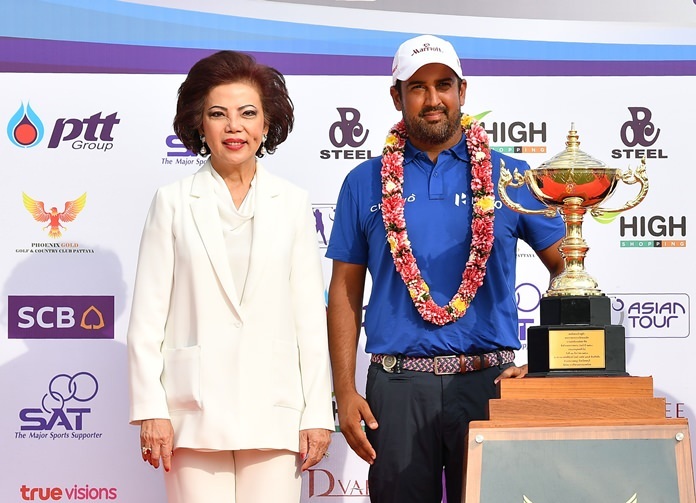 Chanya Swangchitr, President of Phoenix Gold Golf and Country Club (left) stands alongside 2017 Royal Cup winner Shiv Kapur of India. 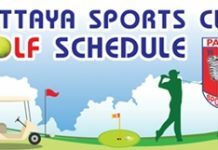 The highly-acclaimed Royal Cup, held in honour of King Rama X is set to be held at Phoenix Gold Golf and Country Club in Pattaya from July 26 to 29. India’s Shiv Kapur, who won the 2017 edition for his record third title last season, is set to defend his title against a talented field. The 2018 Royal Cup, which offers a prize purse of US$500,000, will be held in conjunction with the 66th birthday celebration of His Majesty King Maha Vajira­longkorn Bodindradebaya­va­rangkun, which falls on Saturday, July 28. Man of the moment John Catlin of the United States, who became the first player to win twice on the Asian Tour in 2018 following his victory at the Sarawak Championship, will headline the 156-man field alongside countryman and one-time winner Paul Peterson. A strong Thai contingent, featuring Pavit Tangkamol­prasert, Prom Meesawat and Panuphol Pittayarat, will also take aim at recapturing the trophy on home soil in the prestigious event, which marks the Tour’s fourth stop in Thailand this season. Phoenix Gold Golf and Country Club was the host venue of the Queen’s Cup, where Thailand’s Jazz Janewattananond claimed his second Asian Tour title last month. The tournament was held on the Mountain Course (front-nine) and Ocean Course (back-nine). The Royal Cup will play the front-nine on the Lake course and the back-nine being on the Mountain course. The par-70 set-up measures 6,716 yards in total. A Monday-qualifier offering 10 spots for the Royal Cup will be held at the Phoenix Gold Golf and Country Club on July 23.